We returned Junior Coed Cheer + Junior Coed Group Stunt Champions for the 2nd year running. It was a long but excellant weekend for the STC. Travelled to our hotel on Friday night, saturday arrived at the arena to compete in our Junior Coed division. Sunday we returned to the Arena to Compete in the Group stunts and Dance. Junior Coed AWESOME.... every stunt hit. Loads of smiles and faces pulled. Lovely single bases and tumbles boys and girls and you made your points and got your bid to DENMARK. Dance has never been our thing, we normally enter this so that the girls get to go on the floor without the worry of their stunts hitting and just enjoy the experience. They went out and looked fantastic, the best they have ever done it. 8th place trophy to show for all the fun you had out their on the floor. Group Stunts...Junior Coed pulled it off, making up the points and claiming your bid. Senior All girl, Great performace well done to all of you, you have had tons of problems with getting the group and the routine together, but Jacey jumped in last minuite and you did great, Next time even better you wait and see. Senior Coed well what can we say..... WOW, We are so chuffed with our 2nd place and bid to Europeans. In the practcie hall it was bit daunting seeing what everyone else was doing, but we went out did what we know we are good at, and obviously we are!! The competition of some squads was great, Chorley Warriors and Leeds as always fantastic. Huge Well Done to the Blackburn Panthers, And all other squads that competed. GOOD JOB!! So we returned from the weekend with Huge Trophies, huge Smiles, and 3 Lovely bids to Europeans in Denmark this year. We are so Excited. GREAT START TO 2007. Thanks to all other squads for their support. 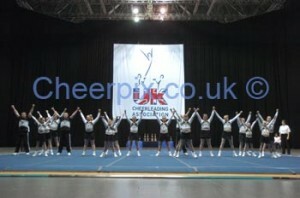 THERE IS PLENTY MORE PICTURES ON www.cheerpix.co.uk take a look.... you can purchase any of them online.